Do you think if you had more time that you would get more rest or slow down? Well, chances are if you had more hours in the day, you would probably fill them up with more things to do instead of creating time to take a much-needed break. The truth is you don’t really need more time in the day. What you really need are strategies to better manage your time. The problem we face in this 24/7 world is that we tend to forget to make time for ourselves. We forget that when we get run down, we put ourselves at a higher risk of being out of commission. Unfortunately, most of us are only willing to slow down and rest once we get sick or reach the point of exhaustion. Make a “To-Do” list. Do not rely on your memory. Keep one, and I emphasize only one, “To Do” list! This list should include all the tasks you have to do this week. Because we are all so busy, you probably have a list that is way too long. Choose what you can realistically handle. That does not mean you won’t get to other things, it just allows you to take some of the pressure off that comes with feeling like you have to do everything now. You will need to consider which items on your “To Do” list are number one priorities. Those items that have priority could be highlighted, circled or underlined to indicate importance. Remember to cross off or delete the items you have completed at the end of each day and add any that may have surfaced during the day. By prioritizing you are wisely taking control of your time. Delegate whenever possible. Moms and Dads, that includes you. Your children as young as 3 years old can get involved in cleaning up after themselves and should. Next time you tell them “clean your room” or “put your toys away” explain what that means. Does that mean shoving everything in the closet? Throwing everything under the bed?? Piling things on top of one another? Show them how to do it. You will probably have to show them several times, but, like everything else, they will eventually get it. Employers, you can delegate by allowing your employees to take on more responsibilities. Take the time to train your employees and entrust them with a little at a time. In the beginning, make sure to follow up, ask if they have any questions and periodically evaluate their progress. Delegating will pay off enormously in the end as you will have more time to do the important things that only you can tend to. Your employees will feel more valued as well. Toss it – Throw away anything that you don’t want or need, like junk mail. Shred it – Shred anything that has your personal information on it that you don’t want or need. File it – File those things that you do need but not right away. Take Action – These are the items that need your attention – like a bill to pay or a call that you have to make. The longer you wait to open your mail, the more it’s going to pile up and become overwhelming. So, open your mail each day, follow the above instructions, and you will be able to streamline your paperflow to avoid unnecessary clutter and piles of paper. The goal is to touch each piece of paper just once and decide what to do with it at that time. Plan your day. Begin your day with a plan and end your day with a plan. What calls and meetings do you need to prepare for? What are the three top things you’d like to accomplish today? What is the most important thing you want to accomplish this morning? What important things did you accomplish today? What meetings, calls and activities do you need to follow up on? Who do you need to follow up with tomorrow? Don’t forget to update your “To Do” list accordingly. Managing time is more than just the ability to layout an organized schedule. Time management means setting priorities that communicate clearly what’s really important, making wise decisions that help set realistic goals, and setting firm boundaries that allow you to keep the promises you make to yourselves and others. 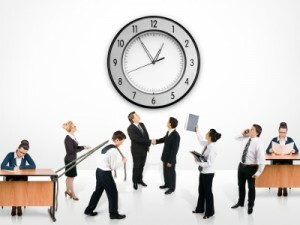 By managing your time efficiently, you have the power over how productive you can be. 96% of those surveyed felt that they could save time each day if they were more organized at home. 91% felt they could be more efficient at work if they were better organized. 71% indicated their quality of life would improve with more organization. So, weigh the price you pay for leaving things as they are against the price you pay to make it better. If you decide that you want to get organized, you will need to invest some time and energy but it will be well worth it. Need help? No problem! Call us now for your 1/2 hour consultation. 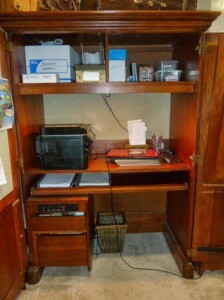 Organizing your office increases efficiency through filing, space planning and time management. 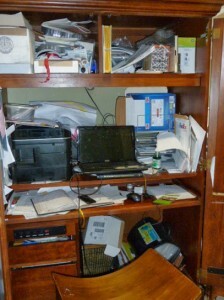 The organization of your workspace plays a big role in how efficiently and effectively you complete tasks at work. Having specific drawers or cabinets for readily used items can save you time when you’re in need of the item. Working in an organized environment can increase your motivation and help you quickly find the items you’re looking for -saving you a lot of precious time. You will save time and money if you are more efficient. Time is money. Therefore, the more time you spend trying to sort through bits and pieces of paper, the less work you’ll be able to complete. This results in more money that you’ll potentially be losing. Loose receipts and stray papers should be filed appropriately and be kept away from your working space. Being properly organized saves you the time to work on assignments and projects that are essential to your work. You will accomplish more in less time. Working in a clean, organized environment feels better. Clutter can be overwhelming, and when you just can’t seem to find that document you’re looking for, you often lose motivation and may become overly stressed. If you place everything where it ought to be in the first place, then you’ll have little difficulty locating it when the need arises. We can set up systems (filing or paper flow) to maximize efficiency and productivity. If you feel as though the work is just too much, know that help is always available. Avoid the stress by hiring professionals to take care of your filing for you. We’ll have your office looking neat and tidy. And you will, without a doubt, enjoy your office space once again. 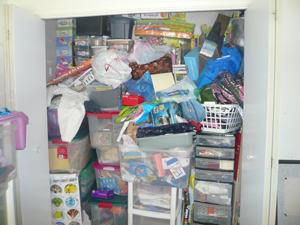 We can organize your space so that you can find what you’re looking for quickly. You don’t need to worry about where you put your important documents and contracts again. Our team will ensure that everything is perfectly sorted so that when you’re in a rush and on the go, you can easily locate the document you need. To get organized and increase your productivity, call us at (310) 560-5060 to schedule an appointment! 1. The first thing to do in any area that that your going to work on is to empty it completely. Yes, completely. Everything out. This is important as this allows you to see everything that was in there and determine what should and should not go back there. 2. 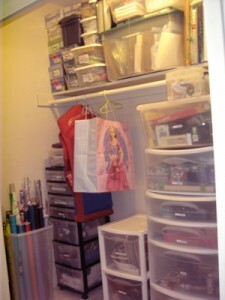 Once everything has been emptied out of the closet, sort everything into categories. For example: all the towels in one place, all the sheets in another, etc. 3. Now it’s time to purge. This means that anything either ripped or stained or no longer in use needs to be thrown away. If you still have twin sheets but no longer have a twin bed, it’s time for those linens to become rags or to be donated. By the way, a great place to donate used linens is pet shelters. The other way is to put a set of sheets into one pillow case so the entire set is in one easily accessible bundle. 5. I suggest keeping two sets of linens for each bedroom so that there’s always another clean set. You can also change linens without having to do laundry right away. 6. 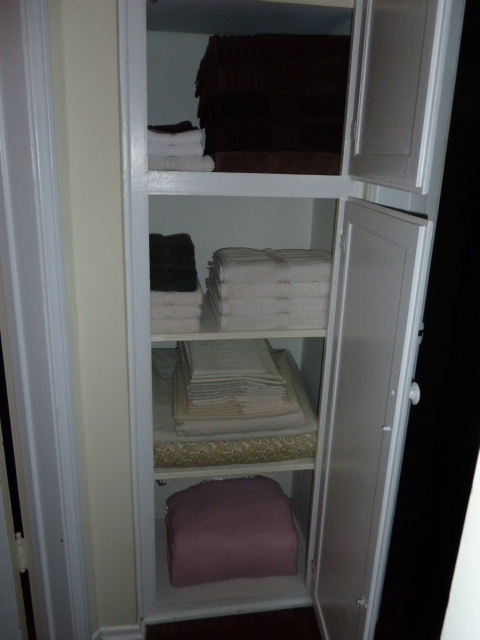 As for the towels, there are several ways you can organize them. If there are several people in the house, I recommend assigning each member of the family a certain color so that everyone knows which towels are theirs. If this sounds right for your family, assemble sets so that each one includes two towels, one hand towel and a washcloth. Another way is to just put all the bath towels together, all the hand towels together and all the washcloths together. 7. Put the items you don’t use frequently on the highest shelves, like your extra blankets and pillows. 8. Then begin putting the rest away by grouping similar items together, sheets on one shelf and towels on another. 9. You may want to invest in shelf dividers. Having the ability to divide blankets from duvets from comforters is a nice touch and will help make everything easier to find as well as just make everything look a lot neater. 10. Finally, don’t forget to label the shelves so that anyone can find what they’re looking for and put them back where they belong. INTRODUCING STOCK-IT-POCKETS –The perfect multi-use organizer for every room in the house! Stock-it-Pockets is a see-through organizer that slips over any door. The clear pockets allow you to see the contents of each pocket and the roll, tie and go feature makes it easy to transfer from place to place. Stock-It-Pockets is durable, made of water resistant polyester. There are both large and small pockets so you can store just about anything. Traveling? You can take it with you! Get the extra storage space you need on cruise ships, camping trips or even hotels. Stock-It-Pockets gives you extra storage space wherever you need and it installs in seconds. *NOTE: Stock-it-Pockets are different than other over-the-door organizers. The clear, multi-sized pockets allow the contents to be easily viewed and the pockets are square at the bottom to fit a variety of items. Vacations are supposed to be fun! However, it’s hard to relax when you’re thinking about all the things you have to do before you leave. There are so many things to remember and so many things to do before you leave. Notify the post office and arrange for them to hold your mail. Let your neighbors or a good friend know when you are going to be away and ask them to keep an eye on your home. Leave a house key with your friend or neighbor. Leave your contact information with key people in case of emergency. Adjust thermostats to save energy. Pay any bills that will come due while you are traveling. Lock all doors and windows. Set security alarms. Set up timers on lights and TVs so your home looks lived in. Inform your security monitoring company that you will be away and arrange for a security patrol. Check the fridge/kitchen for perishables and dispose of them. Take the garbage out! Wishing you a safe and relaxing vacation!